Keeping fit doesn’t always have to be a cardio or strength training routine. Hiking is a fun way to stay healthy; make it a date and enjoy the outdoors. My husband David had a day off of work and our kids were off with the grandparents. It can be hard to find a fun day date activity in the middle of the week. After a lot of searching we decided on doing some Olympic National Park hikes. We couldn’t decide on which one to do so we did two: a Sol Duc Falls hike (1.5 miles) and a Hurricane Ridge hike (2.5 miles). It’s taken me some time, but I’ve established a regular workout routine for myself. When I was younger, exercise was not part of my life. Sure as a kid, I played outside, climbed trees, ran around, road bikes, went roller blading and all those fun activities that helped burn off energy. But, in junior high and high school, I didn’t play any sports or go running or include exercise in my life in any sort of regular way. David on the other hand, was very active, played many sports, and enjoyed exercising (What?!?). We are all more active now that we are a Tae Kwon Do family. One of the many wonderful influences David has had on my life has been in the area of fitness. I knew intellectually that exercise was an important part of staying healthy. However, that didn’t help me with not actually wanting to do it. I had to put exercise in my schedule and make myself do it (Type A here, I love checking off lists). Now, I’ve gotten to the point where I look forward to my workout and miss it if I can’t do it. It really helps to have an accountability partner when working out, especially if you’re trying to develop a new habit. There have been seasons in my husband’s career, when we have been able to workout together regularly. This is so helpful because if one’s tired we can help motivate and encourage each other. We both want to be healthy and active, go on adventures, and have the energy to keep up with the kids. Last summer, my parents asked if the girls could stay with them for some special grandparent time. Ummmmm ….. Yes!!! My husband got the day off, but now what to do on our impromptu Day Date. We decided to try a couple olympic national park hikes. The area around us is beautiful, so we went exploring. Our first stop on our adventure was Little Devil’s Lunchbox in Port Angeles, WA. We had a couple burritos (The Smoker and The Jonny) made into salads, skipping the rice, and took them to-go for a picnic lunch. 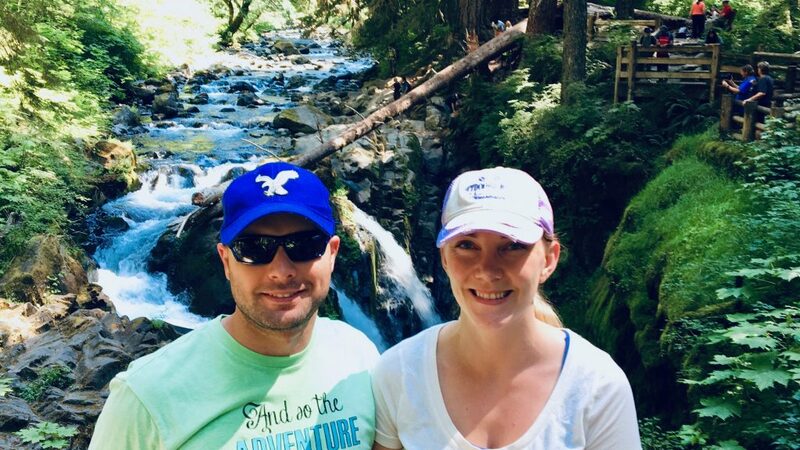 From Port Angeles, we went to see Sol Duc Falls. It’s quite unlike any waterfall I’ve ever seen. Instead of being one large waterfall plummeting into a large, open pool, it was 3 waterfalls coming down channels carved into the rocky landscape and cascading into a narrow canyon. 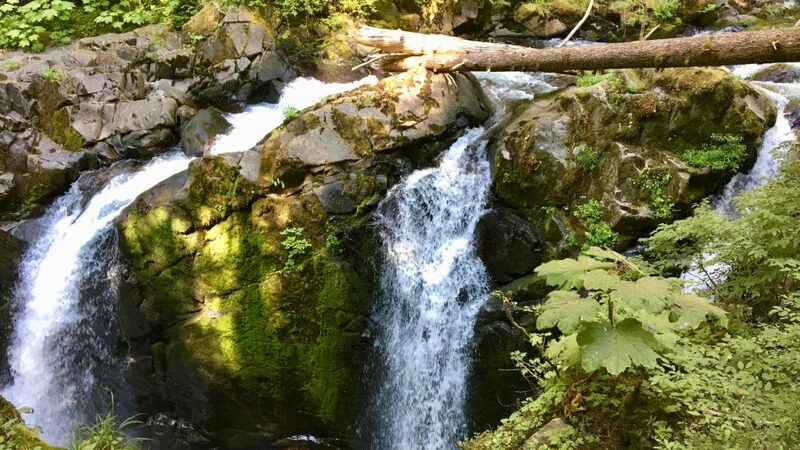 The Sol Duc Falls hike is short (about 1.5 miles) on a family friendly, well maintained path through the beautiful forest. We will definitely be bringing the kids back here. The next stop on our date was the Hurricane Ridge hike. We’ve been here in the winter for sledding and snowboarding with the kids. But, this was our first time visiting in the summer. The Hurricane Ridge hike has many trails of varying length and difficulty to explore. 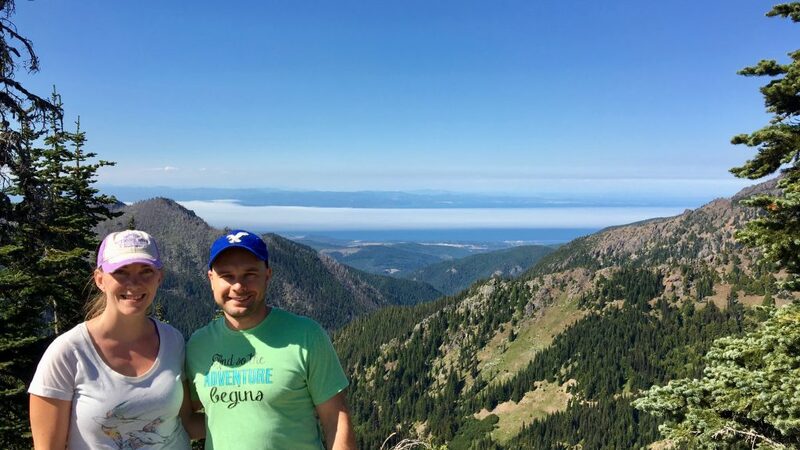 We enjoyed the breathtaking, panoramic views of the Olympic Mountains, across the Straits of Juan de Fuca and all the way over to Canada. My husband and I are both competitive. So, our fitness watches added to the days fun with some unexpected friendly competition. It wasn’t our plan at first, but we found ourselves comparing the stats on our watches. Who is burning the most calories, who’s taking the most steps, who’s getting their heart rate up the most, who can get back to resting heart rate the fastest? In the end, our fitness day date was filled with beautiful views, laughter, adventure, great company, friendly competition (oh, and exercise too). So here’s to making fitness a fun part of your life.